﻿ Best Price on Jodokus Inn in Montezuma + Reviews! Located in Montezuma, Jodokus Inn is a 19-minute walk from Montezuma Waterfal. With free WiFi, this 4-star hotel has barbecue facilities and a garden. The property has a shared lounge. At the hotel, every room includes a terrace. Rooms are equipped with a private bathroom equipped with a shower, while certain rooms have a kitchen. All guest rooms will provide guests with an oven. A continental breakfast is available every morning at the property. Hiking is among the activities that guests can enjoy near Jodokus Inn. 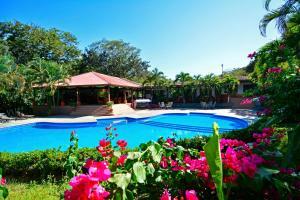 The nearest airport is Tambor Airport, 14 miles from the accommodation. The property is located 1.9 mi from Montezuma uphill. A car is recommended. Guests are required to show a photo ID and credit card upon check-in. Please note that all Special Requests are subject to availability and additional charges may apply. Please inform Jodokus Inn of your expected arrival time in advance. You can use the Special Requests box when booking, or contact the property directly using the contact details in your confirmation. Payment before arrival by bank transfer is required. The property will contact you after you book to provide instructions.